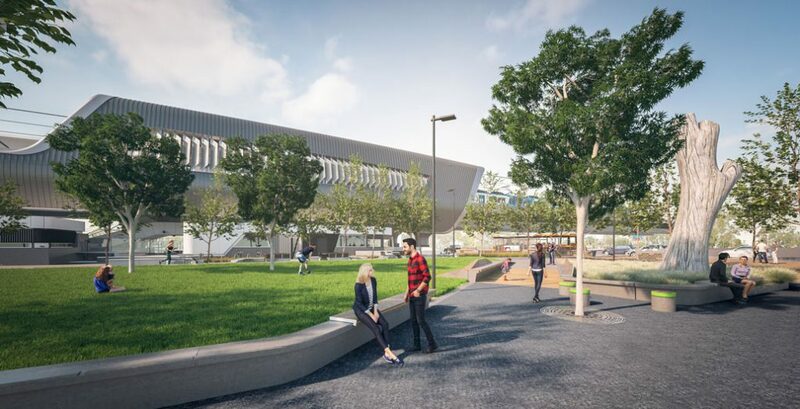 An artist's impression of the Noble Park Station precinct, sitting in Melbourne's south-east. Image: LXRA. Does government issue public consultation really give the public a voice? 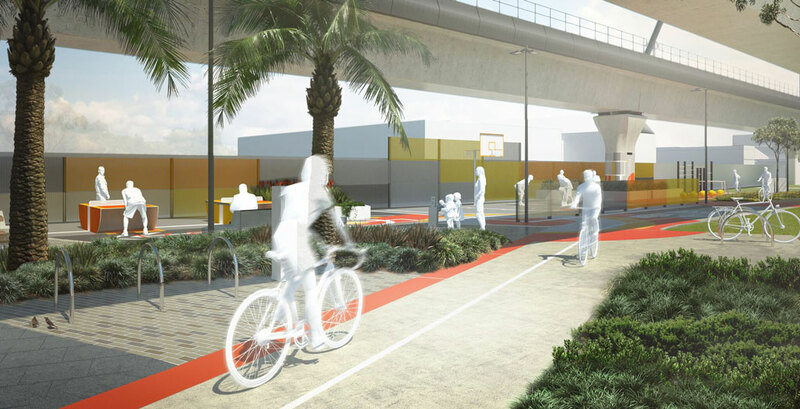 That’s the question urban design think-tank Office posed of the Skyrail linear park project. With the park’s final designs just released, we speak to Office to see if local residents were heard. 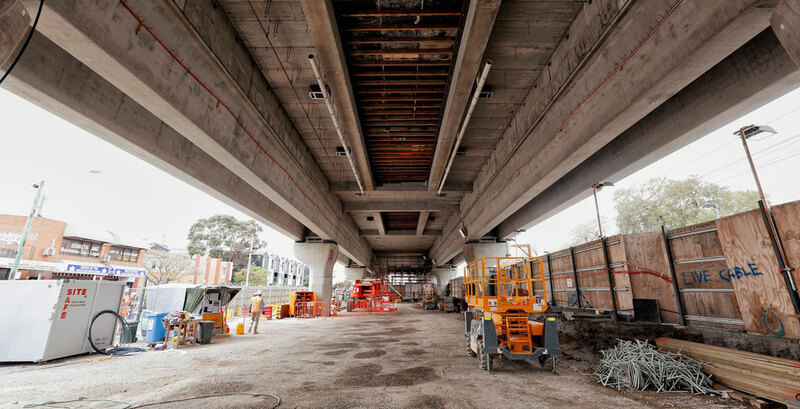 Due for completion in late-2018, Melbourne’s newest elevated railway line will remove nine level-crossings, build five stations, and convert “111 MCGs’ worth” of vacant land into open public space. 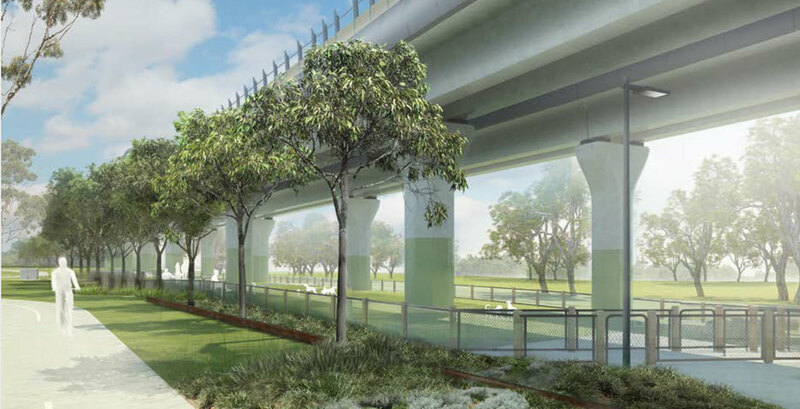 Delivered by the Victorian Government’s Level Crossing Removal Authority (LXRA), the final piece of the project is nearing completion: a 17-kilometre linear park sitting directly under the rail overpass. 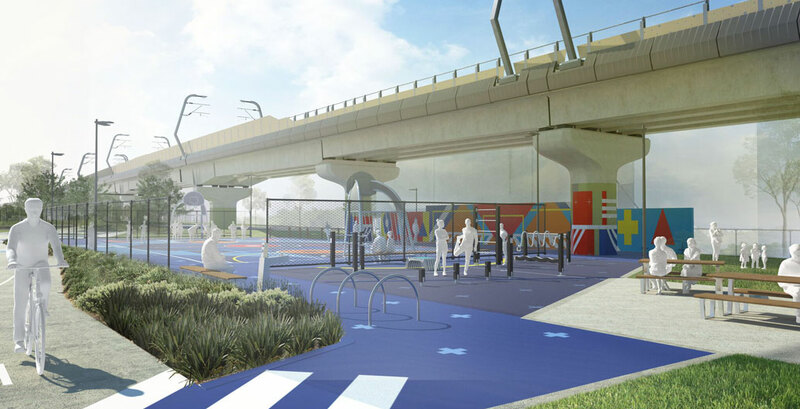 Located between Caulfield and Dandenong, the park will be split into seven sections, featuring multi-use sports courts (such as netball, basketball, futsal and table tennis), fitness areas, bouldering units, a RSL memorial and ceremonial space, and 400 new car parks. But with so much of this project riding high (both literally and figuratively) on the aspirations of its users, and the government that serves them, some are wondering whether the authority actually cared about the outcomes of community consultation. 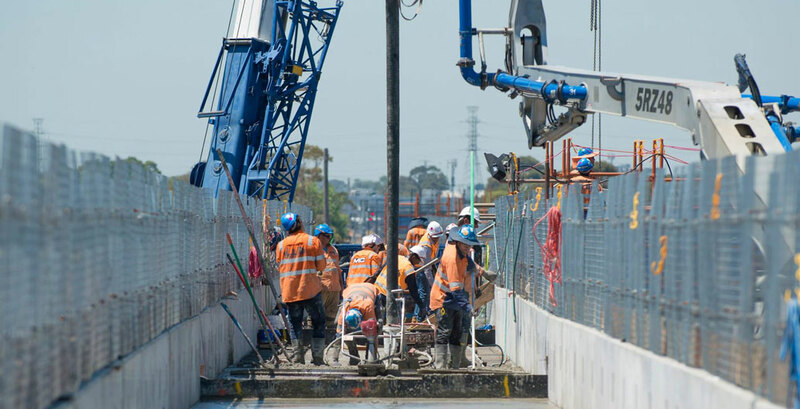 Above: An overview of the Caulfield to Dandenong Skyrail project. Mintern, along with Office, took it upon themselves to establish an alternative community consultation option, called Leftunder. While the authority engaged in a sizeable number of direct and indirect consultations, Office argued for an unfiltered and open consultative process, seeking honest input from the park’s beneficiaries. 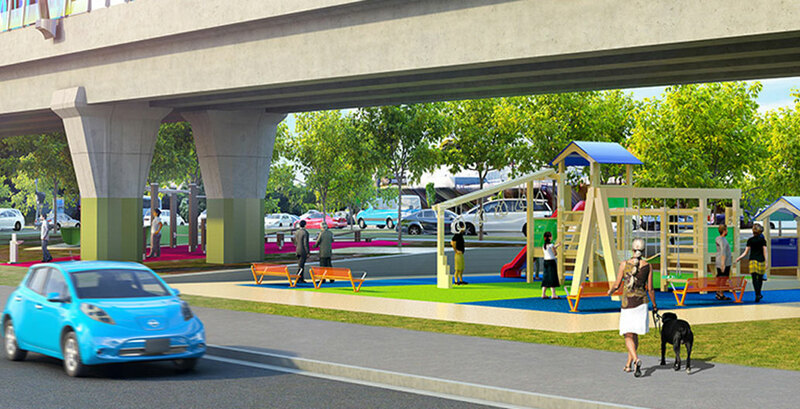 At various points through the park, playspaces will be accessible to residents and visitors. Image: LXRA. 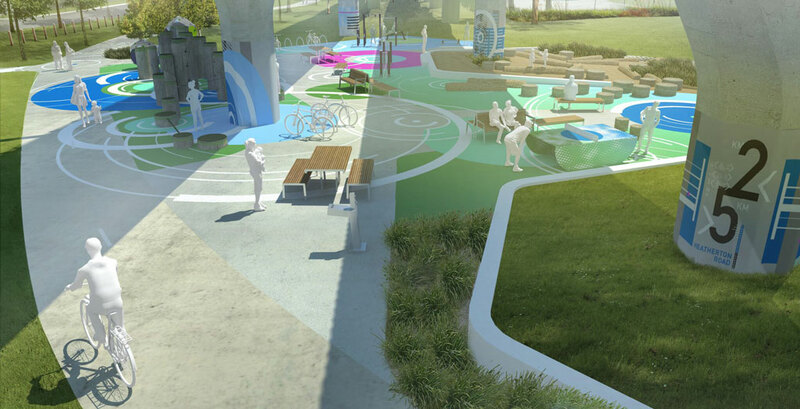 The park will incorporate mixed-use modes of use for residents and visitors. Image: LXRA. 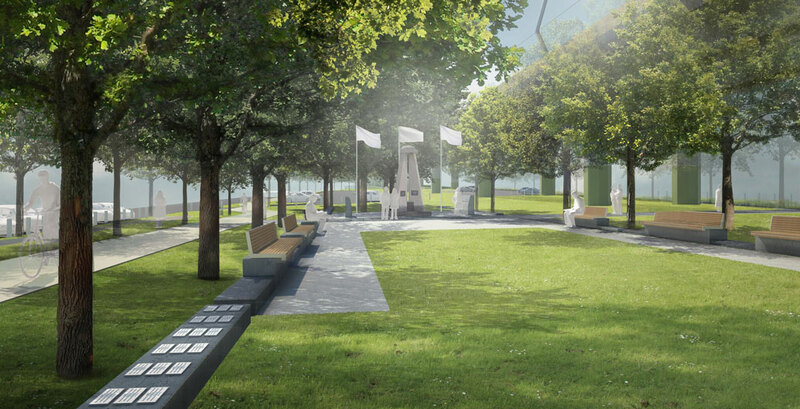 The park's proposed RSL memorial and ceremonial space. Image: LXRA. The authority states that the plan allows for 4000 new trees to be planted across the corridor. Image: LXRA. Centre Road East in Clayton will facilitate a number of different ball-sports. Image: LXRA. Community ‘lounge’ spaces on Heatherton Road, Noble Park. This discrepancy is apparent when you compare the open space consultation findings from Office and the LXRA. While the authority fielded 1573 written submissions, not one articulated the opportunities for habitat development, despite eight percent of those submissions discussing the project’s impact on vegetation. By contrast, one Leftunder resident spoke of the opportunity for Skyrail pylons to include habitat boxes, “preferably for native birds and species other than possums”. For the most part, the nature of the criticism surrounding the park stemmed from irrational fears of the “overpass”. One resident, Michelle Bennett, told the Herald Sun that “everyone is concerned about security and safety”. 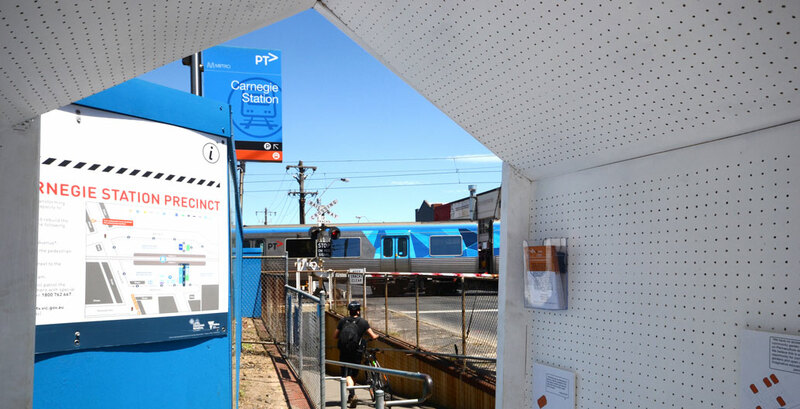 However, the newspaper failed to acknowledge that her suburb of Carnegie sits in one of the safest local government areas in Victoria, with a crime rate of 3896.8 per 100,000 people. It is, however, easy to understand why perceptions such as Bennett’s continue to linger. Popular culture has cast underpasses as crime-ridden, such as in the Batman franchise, sites for the abnormal in A Clockwork Orange (1971), and reaching back into history, a home for trolls, thanks to fairy tales such as the Three Billy Goats Gruff (1841-44). A Leftunder consultation box at Carnegie Station. Image: Leftunder. Folly for a Flyover, London. Image: Assemble Studio. A snapshot of some of the community's ideas when tabled with Leftunder. Image: Leftunder. Construction staff pouring concrete for the elevated rail deck. Image: LXRA. The hollow core deck at the Clayton Station. Image: LXRA. 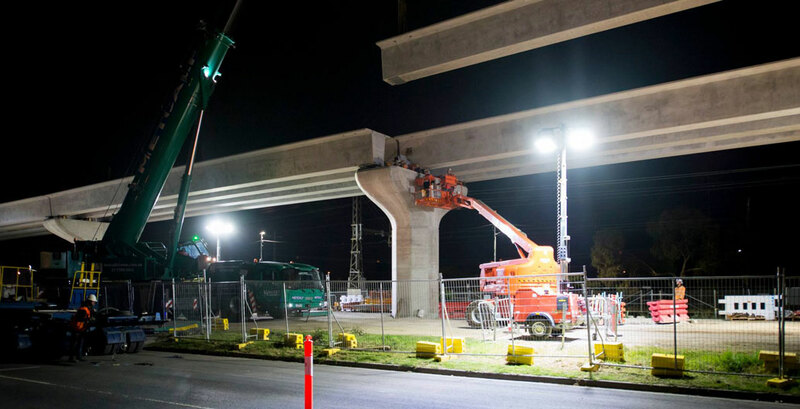 The last beam slotted into place between Clayton and Noble Park, totalling 384 beams spanning 2.8km. Image: LXRA. 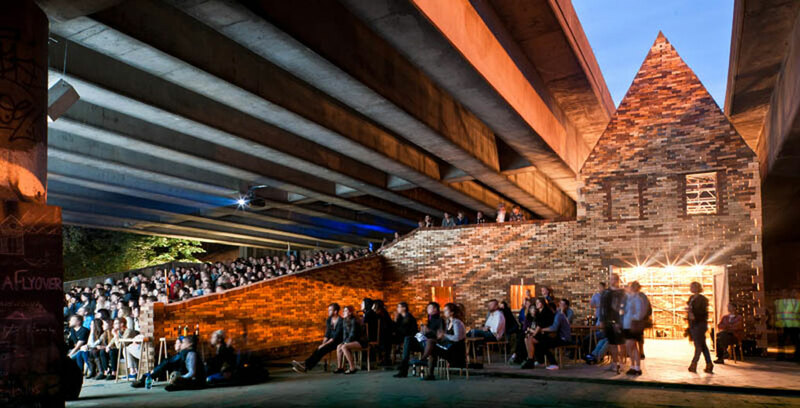 In the lead-up to the consultation period, Leftunder looked at the ‘good stuff’ in overpass conversions around the world, charting sites in Europe, the UK, and Canada. One of the most famous rail-park conversions in the past decade has been New York City’s High Line – a 2.3-kilometre-long elevated linear park. Once a freight line to carry food and agricultural goods through Manhattan’s West Side, it has become a haven for design-doyennes and Instagram’s #archiporn community since being turned into the park in 2014 (having sat vacant since 1980). 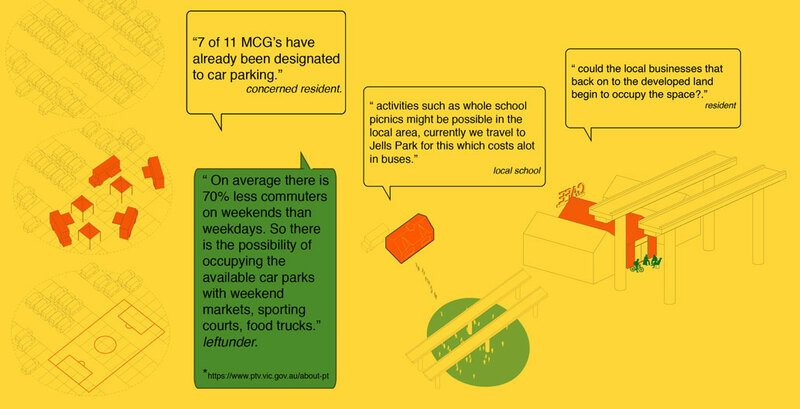 While Melbourne’s linear park is unlikely to host the same kind of groundbreaking conversion of public space, people like Mintern aren’t going to sit around and be complacent, given the “two years’ worth” of qualitative data the Leftunder project can continue to provide planners. OFFICE is a multidisciplinary not for profit, interested in the urban realm and all its intricacies. As a collective it is responsive and adaptive, collaborating at a number of levels, committed to be socially engaged. Steve Mintern is a landscape architect and OFFICE’s co-director.